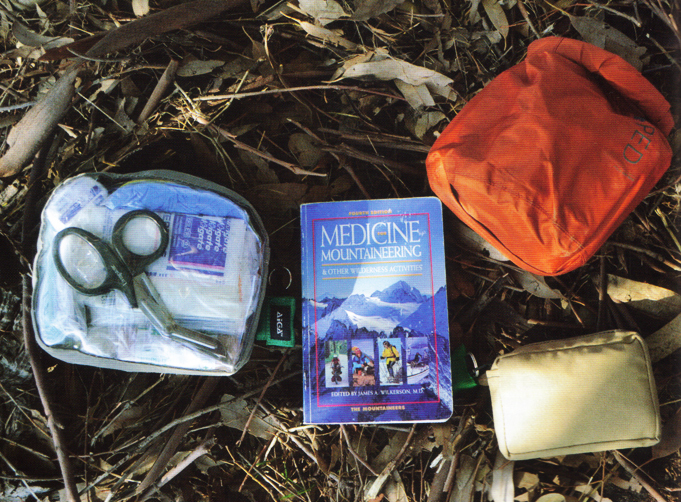 ABOVE : My well used copy of Medicine for Mountaineering & other Wilderness Activities and three of my first aid kits. The large kit on the left (1.2kg) and the kit in the waterproof bag (800g) are remote area group kits for backpacking. The small kit (300g) is what I take for farm fringe hunts where I'm within an hour's walk of the larger first aid kit, or if someone else is carrying a group first aid kit. What do you really need and where do you get it? In presenting this article I must declare that I have used Equip Brand first aid kits for some years while leading groups on extended bushwalks and cross country ski and snow survival activities. 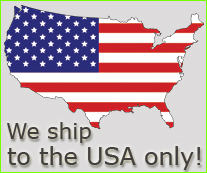 While I acknowledge that this has made me very familiar with the products offered by Equip, I have no affiliation with Equip or any of the suppliers mentioned, and believe that the article presents information in a fair and unbiased manner in order to allow the reader to make informed choices. Good improvisation, but...... a poorly treated injury! Most people I speak to these days have completed a Workplace Level Two First aid course, which is pretty much the minimal standard required to treat minor through to life threatening injuries, and to apply Cardio Pulmonary Resuscitation (CPR). If you haven't done a first aid course you should! For those who are passionate about first aid, the book titled: Medicine for Mountaineering & other Wilderness Activities, edited by James A. Wilkerson, M.D. and published by The Mountaineers is excellent reading. It takes you through the general principles, a range of disorders and injuries and procedures. You have parked the car at the end of a remote track, and, "carrying your house on your back" have walked a half a day into the bush to your camp. On the third day of your five day hunt, you have taken a nice stag bedded on a slope across a gully. An hour after the shot, after battling through the thick scrub at the bottom of the gully, you have arrived at the stag, tired and excited. It is now late afternoon, so you start to cape it. In your excitement you neglect to wear the $20 cut proof glove your wife gave you for your birthday, "Murphy" intervenes, and you cut your finger badly, and while the sight of a copious flow of dark venous blood welling up out of the wound is distressing, the wound is not life threatening, so you can now do one of two things. If you are prepared, you grab your first aid kit and treat the cut. The Benzoin Tincture stings as you clean the wound and helps stick the butterfly dressings to the skin to close the cut and slow the bleeding. You cover the wound with a non stick pad and use an elastic bandage to hold it all in place. You take a couple of paracetamol for the pain, and add a couple of electrolyte tablets to your water bottle, and have a good drink to replace lost fluid and reduce the effects of shock before shouldering your gear and trophy and heading back to camp then home via hospital. If you are unprepared, you wash the wound with your water bottle then wrap your hand with toilet paper, or one of the broad bandages you carry for snakebite and bind it with electrical tape. As you try to gather your gear you fee! the wound opening every time you use your hand. The bandage is soon wet with blood. You finally get packed up, and stop at the creek to refill your water bottle and have a drink to ease your raging thirst. As you climb the hill to camp you feel lightheaded from the shock and blood loss, and your stomach rumbles as you realise you forgot to treat your drinking water. You spend the night with gastro and end up dangerously dehydrated. The situation is now life threatening, so you "pop" your PLB, and end up on the evening news. You sit in hospital while your motes recover your vehicle end gear and, if they can find your stag and the scavengers have left anything, they will recover that too. These two scenarios are both real. 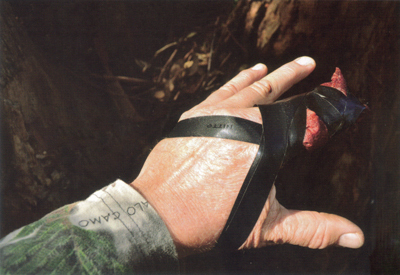 The cut finger happened to a hunter I know, who used good initiative when he bound the cut with toilet paper and electrical tape, but who now carries a comprehensive first aid Kit and a cut proof glove. In my experience, most people I meet who intend to operate in the bush do not carry enough of the right first aid equipment. This is despite having completed a first aid training course, and despite the fact that the parson they treat will most likely be a friend or family member. The "Aids" website - aideport.com/storyy has a great story, where the Kelly brothers who started Aide had to treat a good friend in the bush, and realised the shortcomings of their equipment and training. The story, titled: "Man, I think I can see her brain!" highlights the need for quality first aid knowledge and equipment. So how do you prepare for a medical incident, and what equipment do you need? AIM AND PRINCIPLES OF FIRST AID - WHAT ARE WE RESPONDING TO? The aim of first aid is to save l.fe prevent further injury, protect the unconscious and avoid injury to yourself. Hunters may have to deal with an airway obstructed by blood, vomit, foreign bodies, false teeth, swelling or facial injury. We may need to apply a pressure bandage to stop severe bleeding, apply a ring bandage and splint to an open fracture, recognise and treat shock, protect an unconscious casualty and keep them breathing, immobilise a snakebite victim or treat burns. Eye injuries and heat and cold illness are also within our scope of treatment, as are the more common issues such as treating chafe, picking out a splinter, patching a blister, treating an allergic reaction and easing the pain of sunburn. ABOVE : I SEWED UP THIS CLEAR PLASTIC "TOOL ROLL" ON MY WIFE'S SEWING MACHINE. THE ROLL IS OVER A METRE LONG, AND THE POCKETS KEEP EVERYTHING ORGANISED AND EASY TO LOCATE, BEST OF ALL NOTHING BLOWS AWAY IN THE WIND! Any of these mishaps can occur on a hunt. Whether you are away in a remote area like Fjordland, or on an afternoon farm fringe hunt, you need to be prepared to respond. First aid kits take many forms, and it makes good sense to plan for a worst case first aid situation. The hunter's first aid kit should be stocked with sufficient items to treat all of the people in the group, and the potential injuries the user may encounter during an incident. Remember too, that your first aid kit Personal Locator Beacon [PLB], UHF radio, mobile phone and survival kit all form part of the standard DRABCDE response. The first aid kit I take hunting is based around treating myself and perhaps two other hunters for the common and potential issues previously noted, while I am a day or two away from help. I also carry a more comprehensive and heavily stocked first aid kit in my vehicle. When travelling to a third world country I will add sterile surgical supplies that I give to medical personnel to protect me from infection. The Equip and Aide websites list the individual items within the kit, the weight, dimensions and price of all of their kits and also sell individual items online. The Equip website in particular is well worth a look. Equip are an Australian Company who sell a range of high quality outdoor equipment, and their first aid kits are very well thought out. Equip also have a very useful information section that includes a handy comparison table to help you choose which of their first aid kits is best suited to your needs. 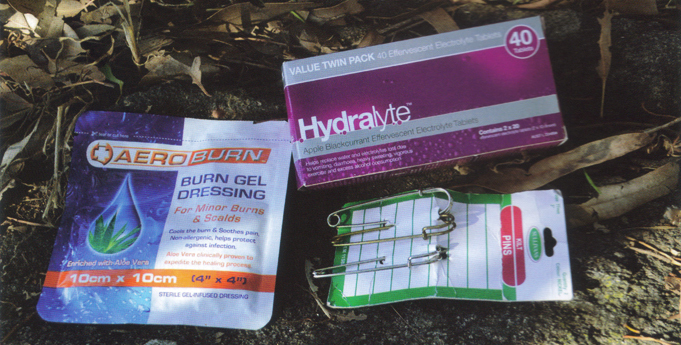 ABOVE : A BURN DRESSING AND ELECTROLYTE ARE VERY HANDY ITEMS TO INCLUDE IN YOUR FIRST AID KIT. KILT PINS ARE VERY HANDY WHEN USING CLOTHING FOR IMMOBILISING LIMBS. WHAT FIRST AID SUPPLIES ARE AVAILABLE? All three suppliers offer a range of first aid kits containing the essential first aid items listed in the table below. Response Check the level of consciousness. Is the casualty alert, semi conscious or unconscious? Do they respond to painful stimuli? Check for any medi alert bracelet etc. Breathing Check the casualty is breathing and start CPR / EAR if required. Circulation Check circulation and treat any bleeding. Defibrilate & Document In the field there probably won't be a defibrillator handy but if there is you should use it. You probably won't get to go to hospital with the casualty, so you should always include a waterproof notebook and pencil in your fist aid kit to document the observations and any treatment or medication you have used so that health professionals down the line will know. 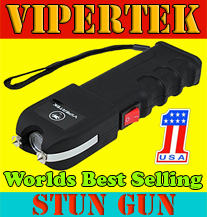 Evacuate For life threatening injuries like snake bite, deploy your PLB. For non life threatening injuries evacuate the casualty by whatever means are available. Trafalgar's 'Adventure First Aid Kit' 'Survival First Aid Kit' & 'Go Anywhere Waterproof First Aid Kit' would all suit a hunter's needs. 'Adventure First Aid Kit' also contains Burn-aid Gel, a poncho and waterproof matches. 'Survival First Aid Kit' includes a wind up torch and whistle. To me, the pick of the kits is: 'Go Anywhere Waterproof First Aid Kit', as it has everything you need and nothing you don't, and the waterproof bag is very useful to protect the contents. That said, a small waterproof bag can be purchased separately to suit whatever first aid kit you purchase. 'PRO 2' measuring 240mm x 160mm x 115mm and weighing 700gm for backpacking trips ($163.95). These prices were correct as at Nov 2015. My pick is the 'PRO 2'. While it is more than twice the weight of the PRO 1, it has the essentials and a range of lightweight professional medical equipment in sufficient quantity to service a medium sized group travelling in remote areas. If you are travelling to a third world country, the Equip Emergency Trauma Kit ($29.80) is good insurance. I'm not so familiar with Aide products, having only recently discovered their website. Aide first aid kits come in dry bags and are well labelled and coded so you can locate them quickly. There are soft cases to keep tools and equipment dry, and most items are foil or vacuum sealed to keep them clean and reduce bulk. Restocking online is a simple process. 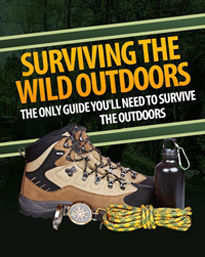 The Adventurer SC - Large group kit ($129.95) is suitable for hunters and includes a 48 page weatherproof Aide first aid guide. The kit weighs 650gm and measures 290mm x 200mm with the depth variable depending on any additional supplies carried by the user. Notes: Always include a pencil and a waterproof notebook (or a sheet of waterproof A4 paper) in your first aid kit. A vehicle first aid kit should contain the same items, and should have at least double the quantities of wound dressings and bandages, as you may have to respond to a multiple vehicle accident. Paracetamol 500mg The recommended dose is 6 tablets per day so I usually take 18-24 tablets - sufficient for a few days. Gastro Stop or Imodium tablets The Traveller's friend - don't leave home without it! Antihistamine tablets I prefer Phenergen 10mg or 25mg, and usually take 10-12 tablets. Electrolyte powder or tablets Tablets are very hard. Itch cream Stop itch or similar for fly and mosquito bites. Betadine Betadine is the industry standard and I use the small throat gargle bottle for everything from sore throats to wound irrigation. Tincture of Benzoin (Friar's Balsam) Tine Benz is an excellent wound cleaner (my Mum always said if a treatment didn't sting when applied it wasn't doing its work, and Tine Benz definitely stings). It makes skin sticky and keeps wound closures in place. Note: In my first aid kits I keep the medications in a separate zip lock bag so that I can turn them over as they near their expiry date. If yau are calling in a helicopter, give your GPS coordinates in degrees, minutes and seconds. If you are requesting a road evacuation, give your GPS coordinates in degrees, minutes and seconds or UTM grid. If you have a mobile phone, your phone number, or if you are using a UHF- radio, the channel you are using. Other relevant information such as a clear place to land a helicopter and how you will mark your position, such as with an orange or blue plastic garbage bag tied to a tree or spread out on the ground. In an emergency, the operator who has practiced with their first aid kit and knows where to find items will be much more useful than the person who is tentative, and unsure of their equipment. Once you have purchased or made your first aid kit, you should practice your skills to keep current. Practicing with the items you carry in your kit will also keep you up to speed, prevent "Risk Shift" and save time when seconds count. However, first aid supplies are expensive so you will have to use your initiative to secure some practice cupplies. You could ask your local pharmacy if you can buy time expired bandages and dressings (yes, they do have a use by date) at a reduced rate. Or ask your workplace Safety Manager, who will often have a stash of expired first aid kit supplies left over from regular restocking of first aid kits. If you are really struggling, you can always tear strips from old sheets, or buy some cheap stretch fabric to make practice bandages from your local haberdashery or Op Shop. You can then have a "first aid practice night" with your family or mates where you practice using common first aid kit items - the kids will have a ball! If you are a bit shy about practicing your first aid skills, think how you would respond when your mate, brother or child needs help. Will you be the bloke who has practiced or the bloke fumbling with the first aid booklet? The aim of first aid is to save life, prevent further injury, protect the unconscious and avoid injury to yourself. It would be fair to say that most people complete a first aid course then never practice their skills. It is also fair to say that a significant number of hunters are poorly prepared to deal with a medical incident, such as an obstructed airway or a fractured limb, regardless of the fact that any of these mishaps can occur on a hunt. Because hunters operate in small groups or as individuals, away from safety, and often in remote areas, my sincere advice is for all hunters to purchase or make their own comprehensive first aid kit and to practice theirfirst aid skills at least annually and certainly prior to a big trip. I am happy to recommend Trafalgar, Aide and Equip as first aid kit suppliers. "MEDICINAL" ALCOHOL IS A KILLER! DO NOT give injured people alcohol. It acts as a vasodilator, sending blood to the extremities when it is needed at the body core. 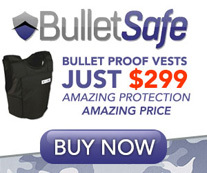 This can lead to hypothermia, and can mask, symptoms such as concussion and blood toss from a ruptured spleen. Injured people may die if you give them alcohol.